In this Lasko 4443 Hybrid Tower Fan review, due to the bulk of this machine, we expected to see some good results. It’s not the prettiest machine and the design is a bit dated and it has its pros and cons, but it does serve a good purpose for the right person depending on what they are looking for. So what is a hybrid tower fan? A hybrid fan is a fan that instead of using a rotating vertical blade within the tower to create airflow, it uses a horizontal fan in the base to force air up and out of the tower. You will notice the base of the fan is much larger than other tower fans and that is because it is the circular housing that holds the horizontal fan blade and motor. So why would you build a fan this way? As you can see above, out of the box this fan comes with a remote control, the fan base, screws for the base and an instruction manual. The base is not difficult to put together and together with a Phillips screwdriver, it shouldn’t take you more than ten minutes to have everything fully assembled. As you can see with this fan this is a lot bigger and bulkier compared to other tower fans, especially the ones we have tested. It is however very sturdy due to the extra bulk at the base of the fan so you won’t have to worry about this fan wobbling around. Like many tower fans, the 4443 Lasko has an inbuilt handle in order to assist moving the fan. on this fan this is quite an important feature given its extra size, bulk, and weight. Also, as you can see below, at the base of the handle is a hook where you can store the remote control when you are not using it. A useful feature that this fan has that many don’t (by design at least) is a night light near the base of the fan. The Lasko 4443 comes with three wind speeds which is a fairly common number of speeds for a tower fan and basically the minimum most tower fans have today. It is on the bottom end of the feature scale with other tower fans such as the Dyson Am07 having 12 speeds to select from. This, however, is the same number as the Honeywell HYF013 and 143 Vornado tower fan that we have also tested and reviewed. Like the Vornado tower fan the Lasko fan cycles through the speeds from 1 – 3 -2 -1 which we still think wasn’t quite the natural order of things, but that is a very minor nitpick. We think it would be nice to be able to choose the speed directly rather than having to cycle through, but it works ok with only the 3 speeds to choose from. Airflow is often one of the most important factors for purchasers when looking to buy a new tower fan. Without any frame of reference, it’s hard to know which fans have good airflow. Sometimes manufacturers might give a CFM measurement and other times you may not even get that. So far we could not find a CFM rating for this fan. In this review, however, we want to give you a tangible measurement which you can use and compare with other fans and you can also be assured that has been tested physically by an unbiased source. The below graph has our recordings for the Lasko 4443 wind speed on all settings so you can have some idea of the airflow of this fan. On its lowest setting, the Lasko 4443 pumps out air at 10.79m/h. On its medium setting, it’s maximum wind speed generated was 13.14 m/h and on it’s highest setting the maximum wind speed reading we recorded was 15.44 m/h. We keep all our tests as similar as we can in order to give accurate comparisons so to see how we conduct our test click here. As far as airflow goes in comparison to the other fans we have tested this fan has by far the greatest airspeed of the fans we have tested. The thing about the Lasko 4443 tower fan however is that the area of which is blows air is actually quite small. By looking at the grill you might think that air would be pushed out of a lot of the fan but that’s not the case. Even the low setting on this fan is blowing a lot of air compared to the other fans we tested. 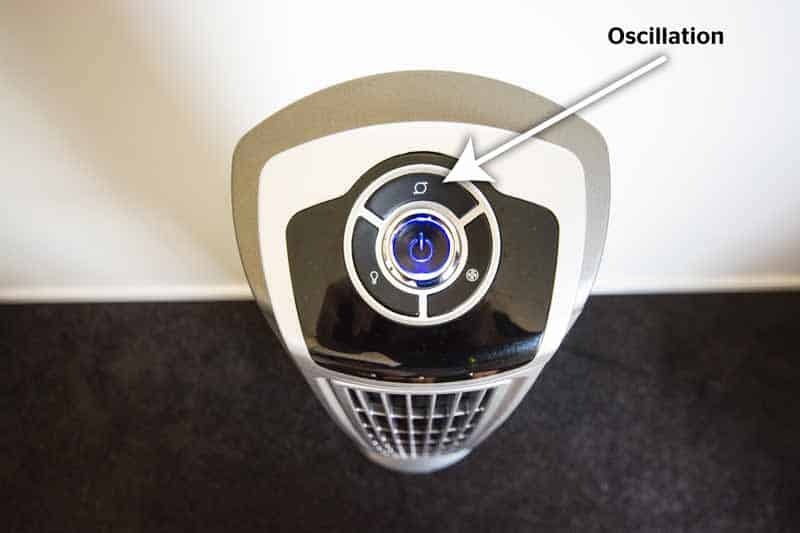 Oscillation is another important feature for some when looking to purchase a tower fan. This feature can spread the airflow a bit more around the room rather than having it all aimed in one direction. With modern tower fans, it is very unusual not to have a timer feature on the fan and the Lasko 4443 tower fan does not have one. With this machine, it is either on or off so, unfortunately. Like airflow, noise is probably the second biggest consideration for most people when looking to purchase a new fan, however, it is hard to find any tangible comparisons online but rather having to interpret what some strangers idea of ‘noisy’ or ‘quiet’ might be. In this Lasko 4443 tower fan review, however, we have tested noise on each setting to find out how loud it is and how it compares to some other fans we have tested. On the low setting, the maximum sound coming from the fan was 58.5 dB. Bump it up to its medium fan speed setting and we recorded a maximum sound of 60db. On the all-important high setting where the fan is blowing the most air, we measured this fan with a maximum decibel reading of 61.6 dB. To give you a frame of reference to how loud this is you can check on this noise comparison chart. How does this compare to the other fans we have tested? Well like the airflow it comes in first place, but that is for the loudest fan we have tested so far. The extra wind speed which this fan has, unfortunately, comes with the extra noise. As you can see below the remote control for the Lasko 4443 hybrid tower fan is fairly simple. It has no lighting on it, so in the dark, you will be pressing buttons by memory but with only 4 buttons it is about as simple as you can get. One of the buttons also controls a nightlight which is useful. It has the 4 buttons, power, oscillation, night light, and wind speed. You have to cycle the wind speed and timer to get to the setting you want. It needs to be pointed at the sensor which is at the top front of the unit, which is actually a bit of a pain being that the unit itself is quite tall, so you will need to be pointing the remote control down, in line-of-sight in order for it to work. 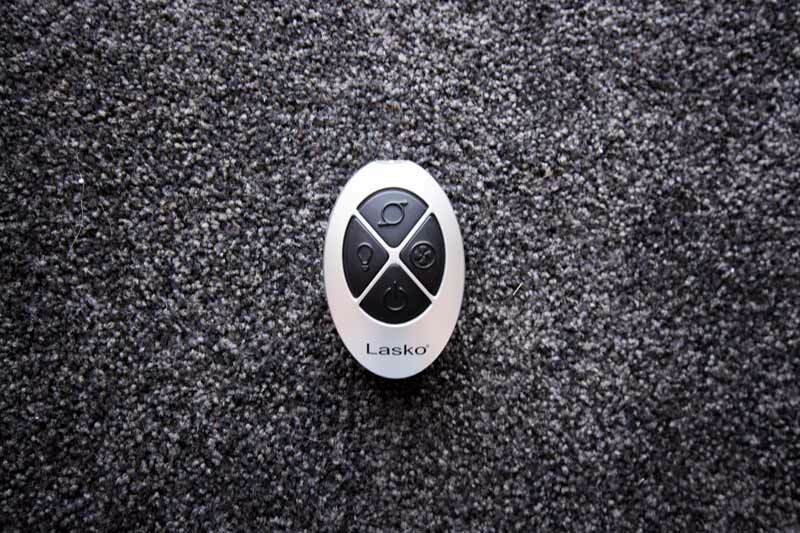 The remote control for this Lasko tower fan is powered by 2 AAA batteries which do not come with the fan upon purchase. The Lasko Tower Fan comes with an overload protection (fuse) in case of a short circuit. It also has a polarized plug for your safety and runs on 120V. Extra fuses can be purchased from Vornado customer service. For those outside the USA you can check what voltage your country runs on here. To get an idea of power usage we tested the fan on all three settings to see how much power it was using. The results are in the below graph. At its lowest setting, the fan was using 47.4 watts. Medium setting was at 49.1 w and the highest setting the fan was using 53.2w. To get a good frame of reference for how much this is you can compare other appliances approximate watt usage here. This fan has also been tested and found to comply with the limits for Class B digital service pursuant to part 15 of the FCC rules. The Lasko 4443 hybrid comes with a 1-year limited warranty which is only valid to the original purchaser of the product from the original date of purchase. This is the same coverage most tower fans get however other companies do have more. 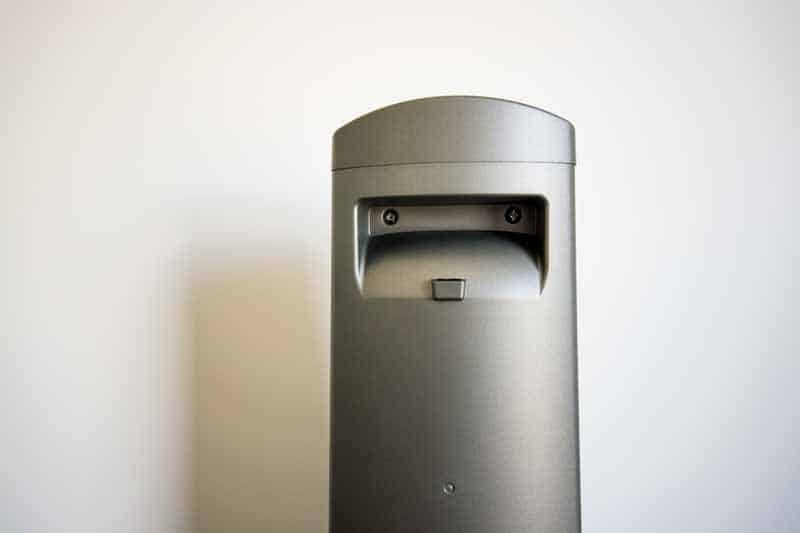 The Dyson Am07 has a 3-year warranty and Vornado tower fans have by far the most cover with 5 years. The 4443 Lasko tower fan is certainly not the most expensive fan out there but compared to a few other Lasko and other models you might pay slightly more. You are effectively paying for the extra wind power which this fan certainly has. With around 84% positive reviews on Amazon.com there are a lot of happy purchasers of the Lasko Tower Fan. However, most of the criticism came in regards to mechanical issues, noise, and small output area. Unfortunately with many tower fans there seems to be a number of defective units. Given that the price of the fans is quite low the quality of the materials is often cheap, so, sadly for the odd person here and there, there become issues. The other most common major complaint was that the fan was loud. Unless you are able to sleep quite easily, we think it would be hard to sleep through the noise this fan makes. even on low it’s still quite loud. The blue tower light on top of the fan can light up the room more than some people’s liking and unfortunately, this cannot be controlled, unless you turn the fan off. Along with that, the remote control sensor is at the top of the fan, so because of this placing, it makes it hard for people to change settings unless you are effectively pointing the remote control down towards the sensor. This irked a number of purchasers too. This one doesn’t really sit on the fence. If having a tower fan that moves a lot of air is important to you, then this could well be a contender, however, if you are wanting something quiet, then not so much. It by far moves the most air compared to the Honeywell HYF013 and Vornado 143. But is also by far noisier than both of those fans. There are a few nitpicks such as having no timer, the power light at the top is quite bright, the sensor for the remote control is at the top of the unit which makes it annoying to change settings since you have to be line of sight along with the fact that the area the air comes out of is rather small. These little things start to mount up. However, whoever is going to buy this fan will be doing it for its power. Have you purchased this fan? If so what are your thoughts and experiences with it? Alternatively, if you have any questions about this tower fan feel free to ask us here and we will do the best we can to give you an answer!